It’s been a while since our last update. 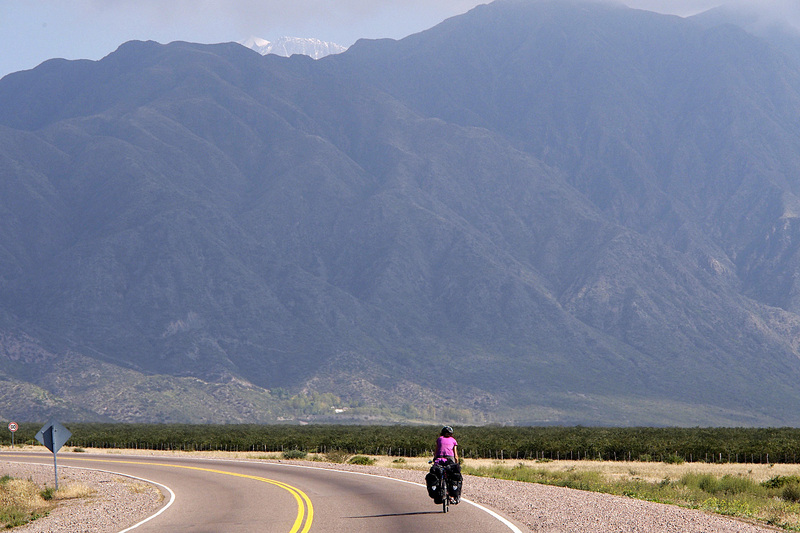 Internet was a bit sparse as we cycled through the mountains of the central interior north of Santiago, Chile. 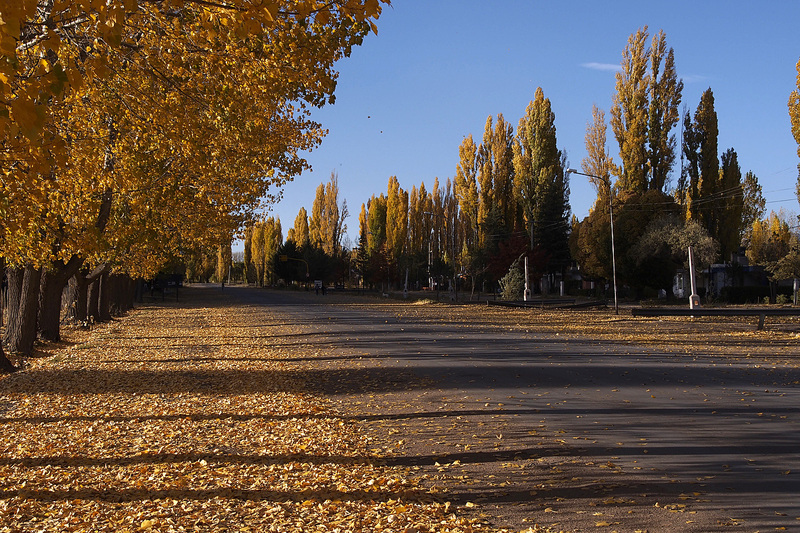 Like all good things, our winelogged stay in Mendoza had to come to an end sometime. And with it, our stay in Argentina. We bid farewell to Hans and Posada Cavieres and headed west out of Maipú towards the high Andes mountains looming in the distance. 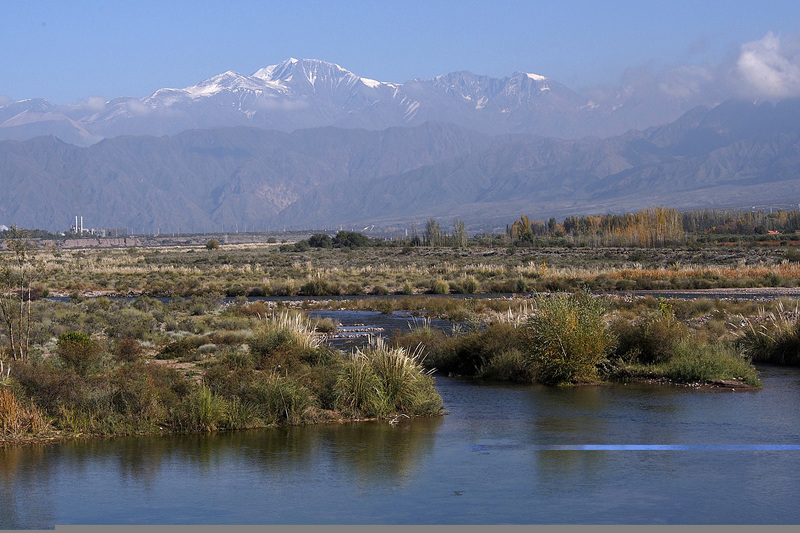 Rio Mendoza with the Andes looming in the distance. 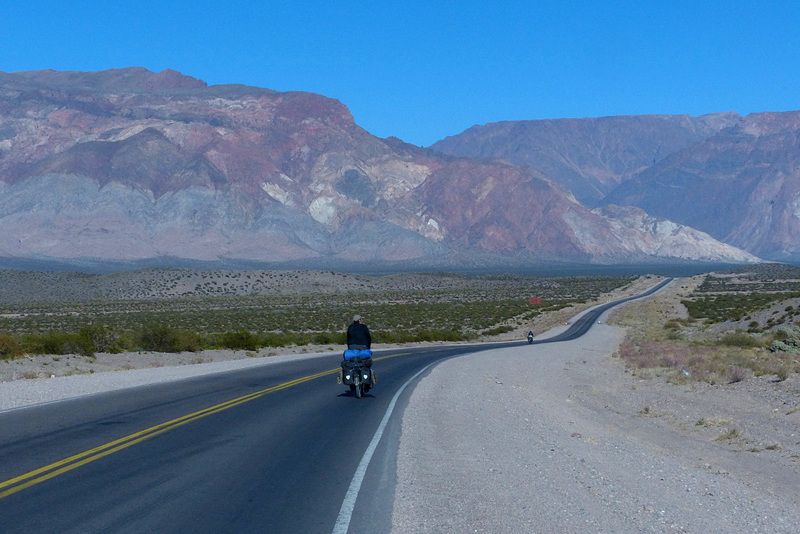 It was a bit of a busy ride out of the metropolitan Mendoza area but soon enough we were on quieter roads. 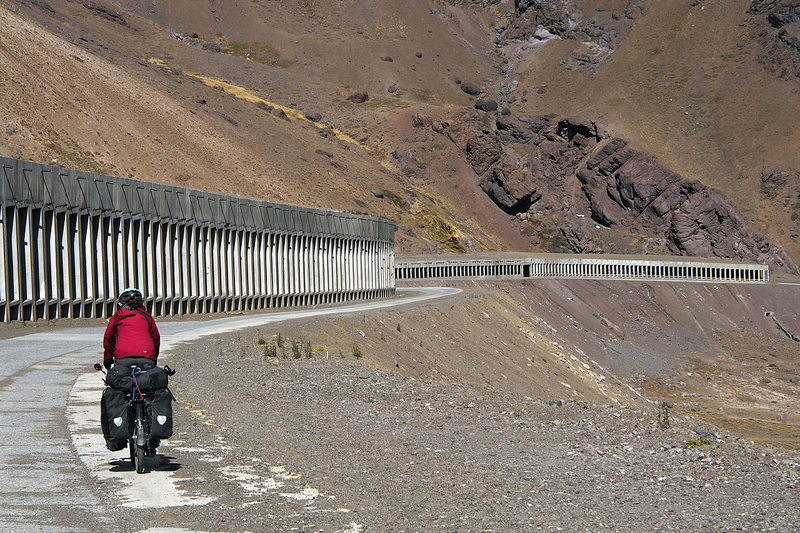 Our route across the Andes was Ruta 7, the only crossing in this area. 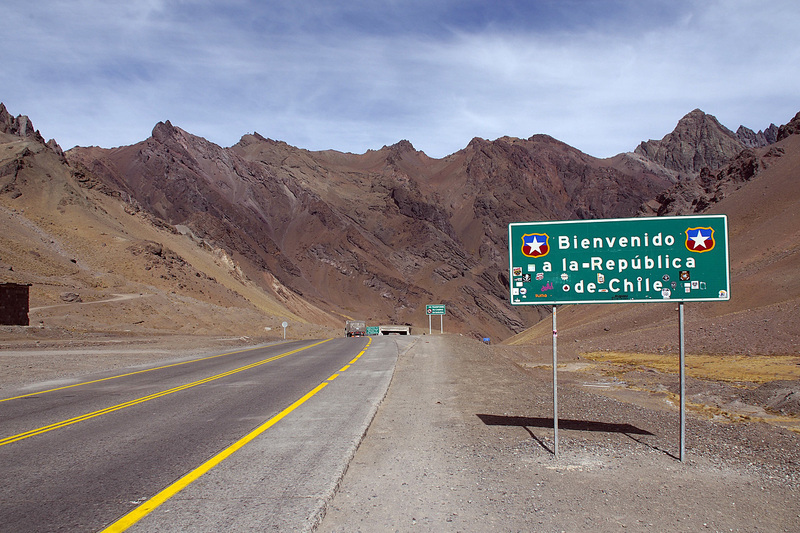 It is also one of the major border crossings between Argentina and Chile and touted as a busy truck route, so we planned to ride west on a weekend, hoping the traffic would be less busy. 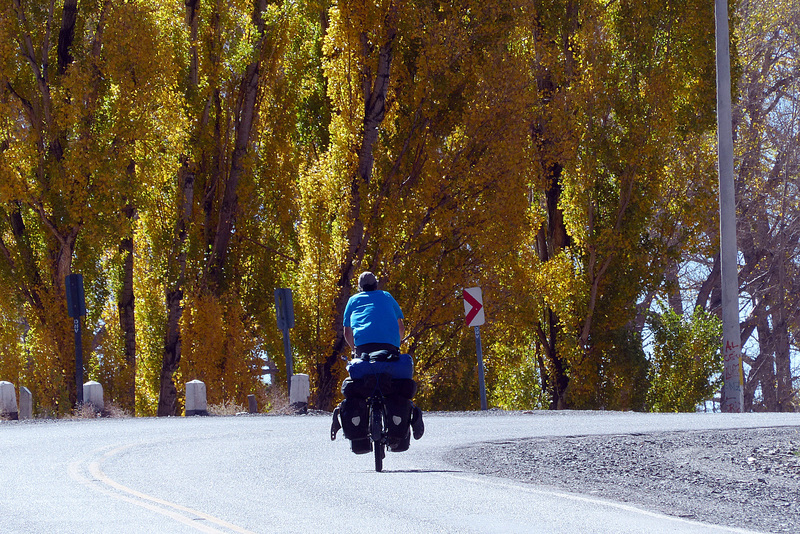 Riding out of Mendoza on Ruta 7. The climb began immediately but so gradually that we hardly noticed. Once out of the city and into the dry countryside, the road slowly meanders up into the Sierra del Tontal in the precordillera, the 4,000-metre-high foothills of the Andes. Our timing was spot on as the weather was again fantastic. 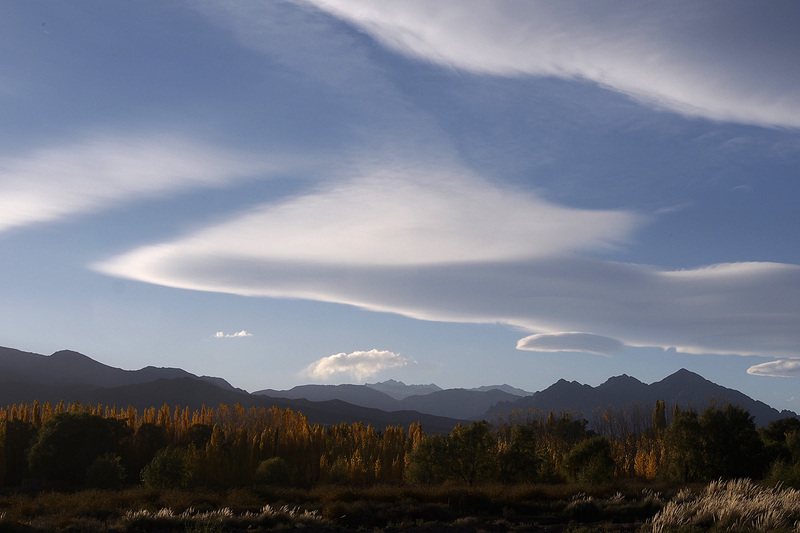 High pressure with stable, sunny weather on both sides of the Andes. 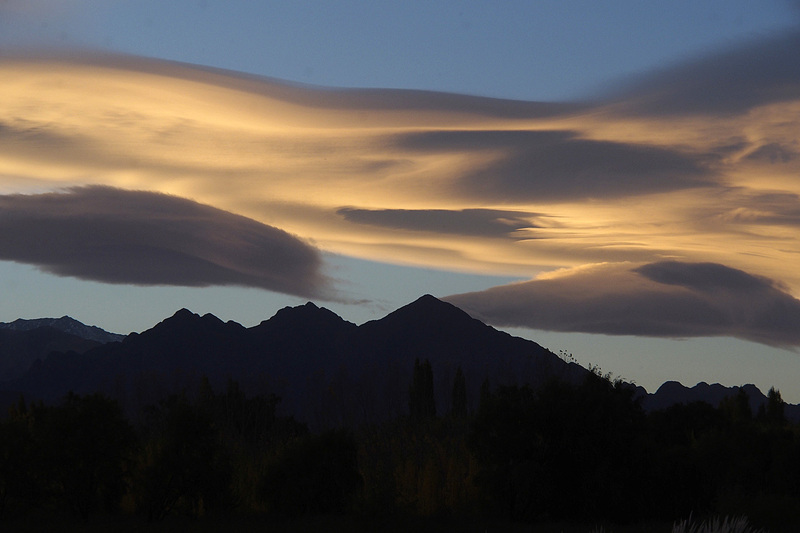 The Andes west of Mendoza. About 20 km outside of the city we met Cyrille, a French cyclist we had met a few times on the road over the last six weeks. 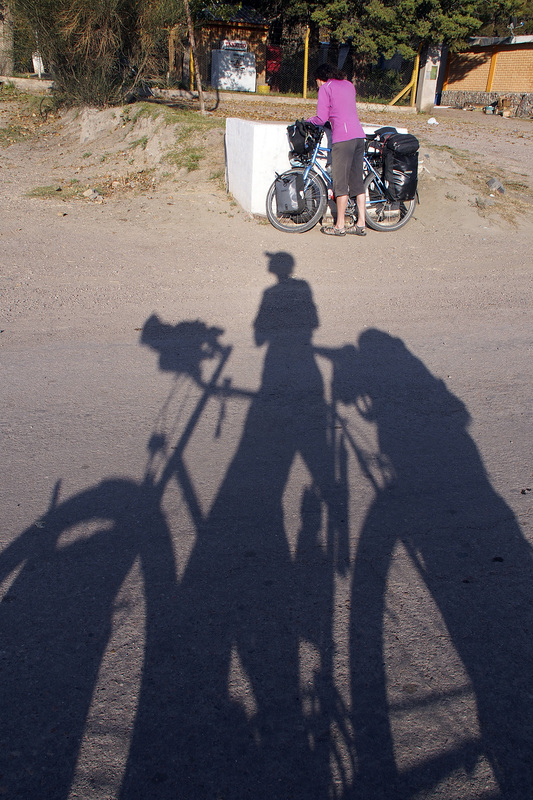 The three of us cycled on together and camped in an ACA (Automovil Club Argentino) campground in the small town of Potrerillos on the shore of Potrerillos Reservoir, created by a dam on Rio Mendoza. Besides a pack of stray dogs, we were the only ones in the camp site. 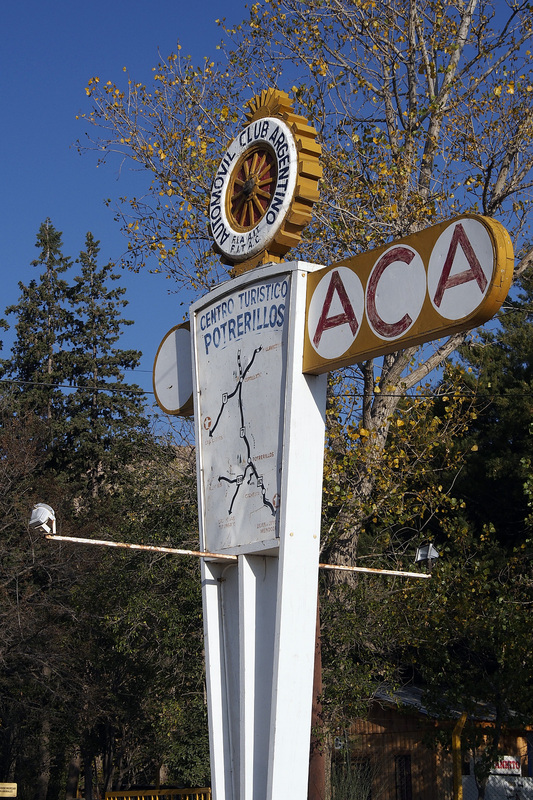 The stylish ACA camp site sign in Potrerillos. 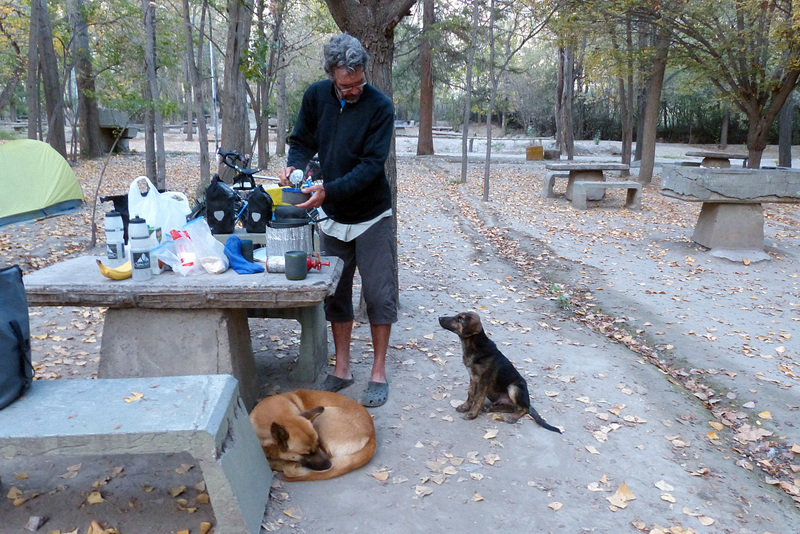 Paul making dinner with an audience in the Potrerillos camp site. Getting ready to ride in the morning. 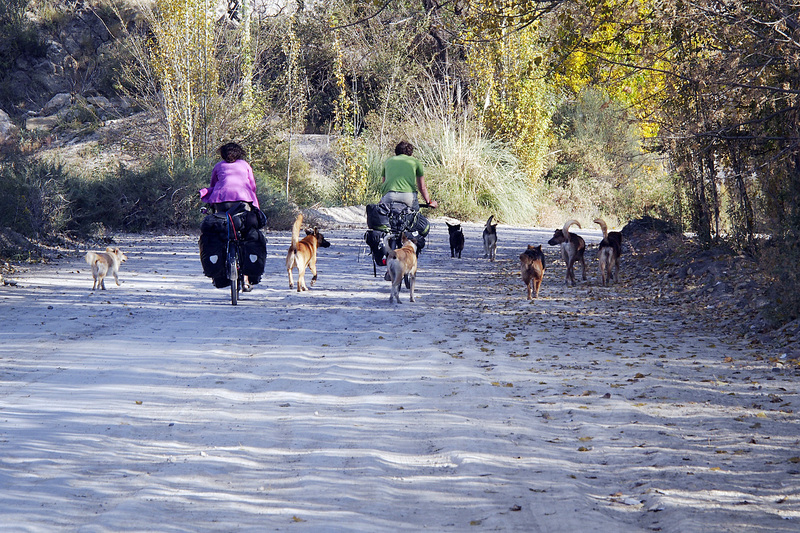 Leaving Potrerillos with a pack of dogs in tow. With the dogs in tow, we headed out in the morning along the shore of the lake for a few kilometres before rejoining the highway to continue our climb into the Andes. 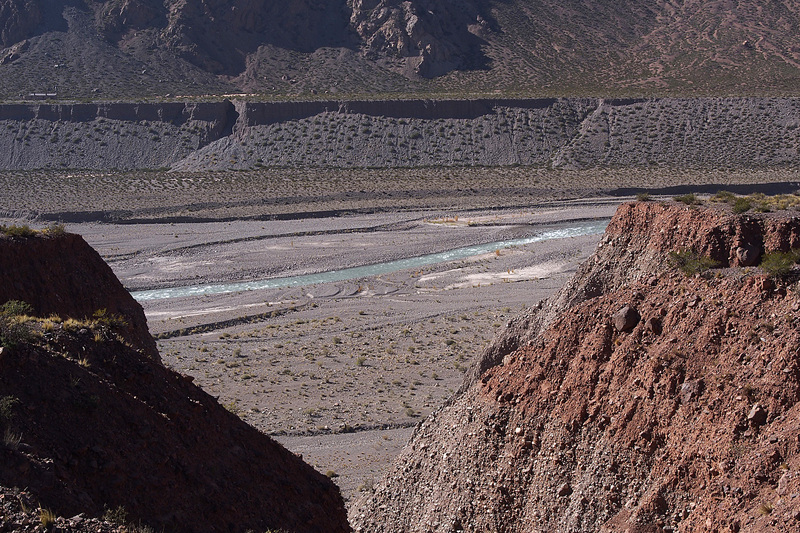 The road follows the Mendoza River for most of the climb. Parallel to the road is a railway. 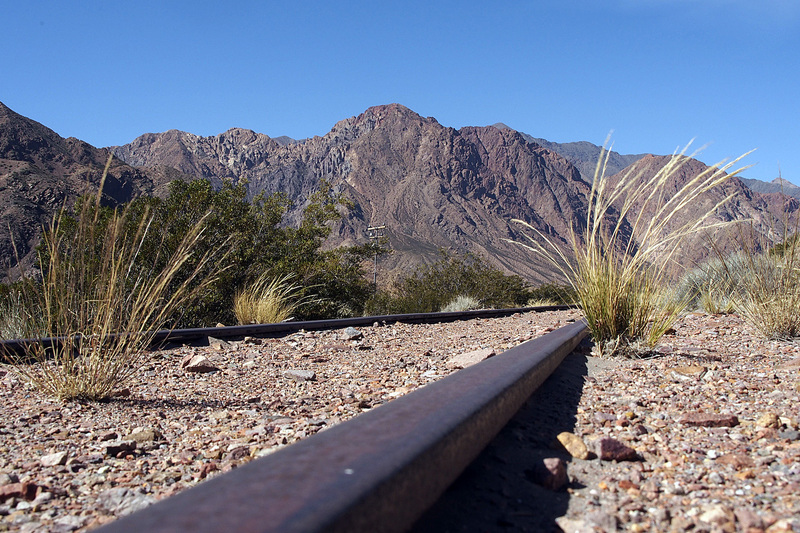 It used to cross the Andes through a tunnel but once the current road and tunnel were built, the railway was abandoned and left to slowly rust away. 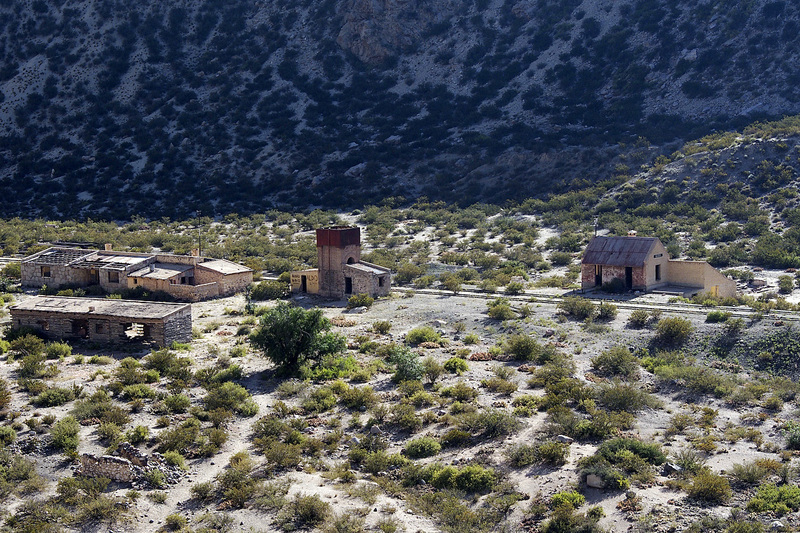 An abandoned railway station along Ruta 7. 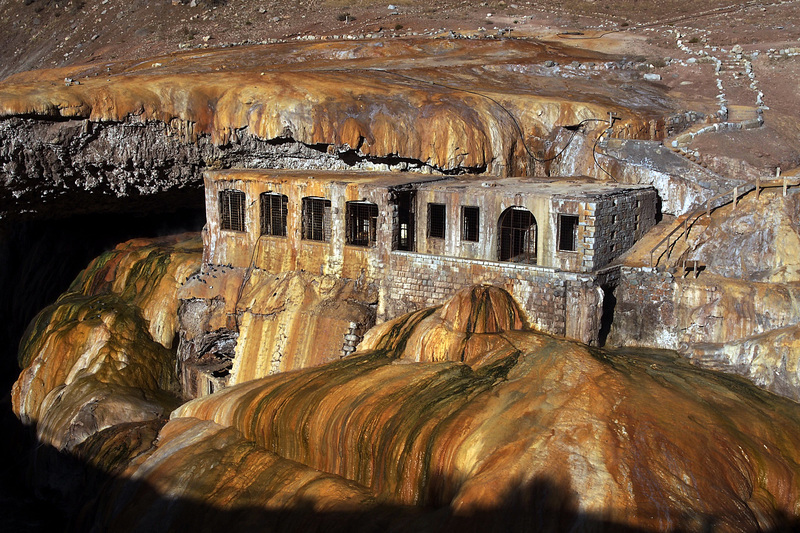 The now abandoned narrow-gauge railway through Cristo Redentor Pass. 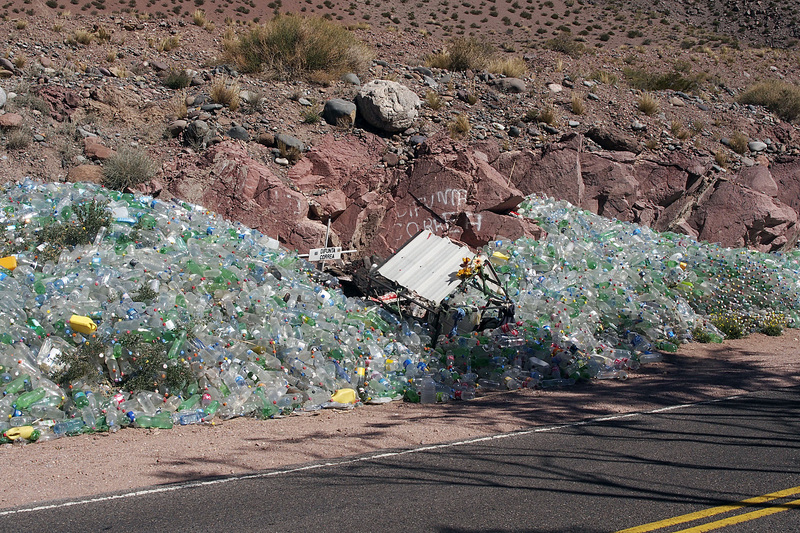 All along the roads in Argentina, we’ve seen these strange piles of plastic bottles. One of the most impressive ones we saw was on our way up Cristo Redentor. It turns out these are shrines to La Difunta Correa, The Deceased Deolinda Correa, a semi-pagan mythical figure from the 1840s. (Click the link to read about the legend.) Truckers leave bottles of water as votive offerings. A shrine to La Difunta Correa. Truckers leave bottles of water as votive offerings. We climbed another 800 metres during our day of cycling to Uspallata, a small town in a gorgeous valley at 1,900 metres above sea level. The entire valley was golden due to the many poplar trees with their leaves bright yellow as fall progresses into winter. You would hardly know it that winter is coming as the daytime temperature reached well into the mid-20s and we wore shorts and t-shirts. Uspallata in full fall regalia. 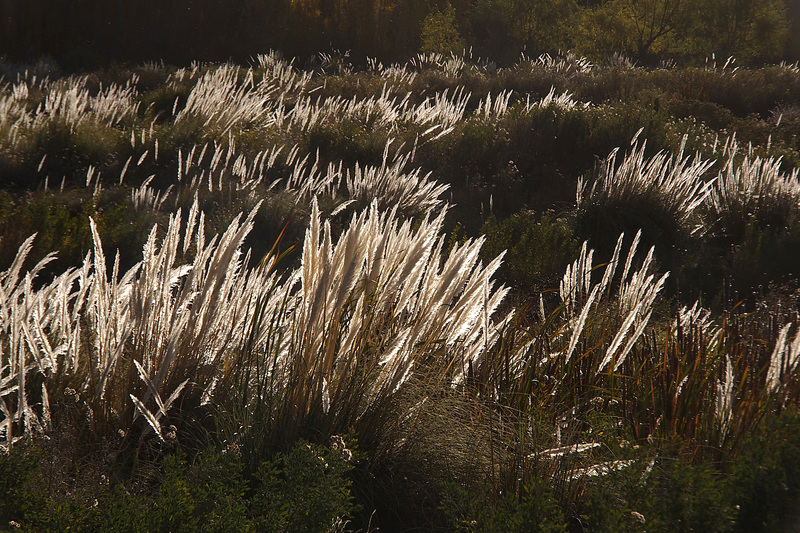 Reeds in a bog in Uspallata. 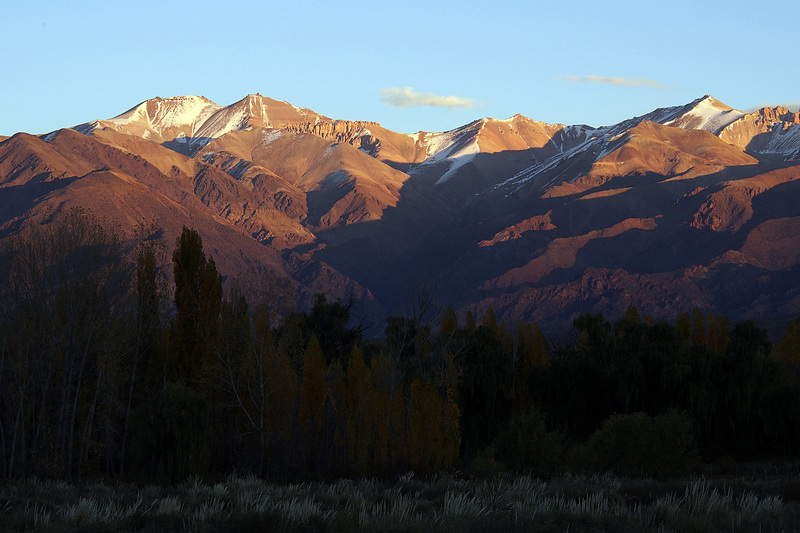 Late afternoon light on the Uspallata valley. We arrived in mid-afternoon but decided to stay anyway in this gorgeous place. Again, the camp site was empty although later in the day a couple of other tent dwellers arrived by car. We went shopping for a BBQ as that seemed like the thing to do. We bought some steaks, potatoes, peppers and zucchinis, some beer to wash it all down (we still had wine that we carried from Mendoza), as well as a bag of wood. Paul and Cyrille chatting by the grill as the sun sets. Back at camp we lit the fire to give it time to burn down and prepared the food for the grill. The potatoes went on first while the flames were still lapping at the grill and when they were nearly done and the fire had sufficiently burned down, the steaks and vegetables went on the grill over what was now a hot bed of coal. 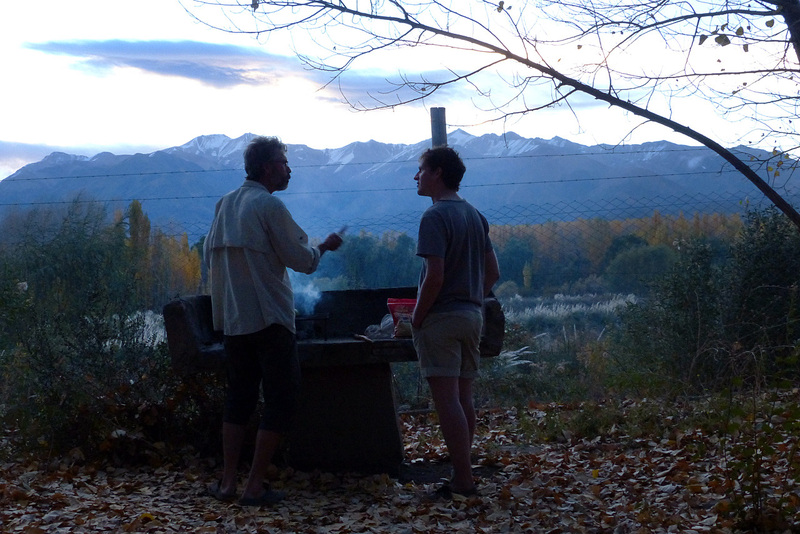 We watched the sun sink behind the Andes as our dinner slowly cooked over the smouldering chunks of wood. 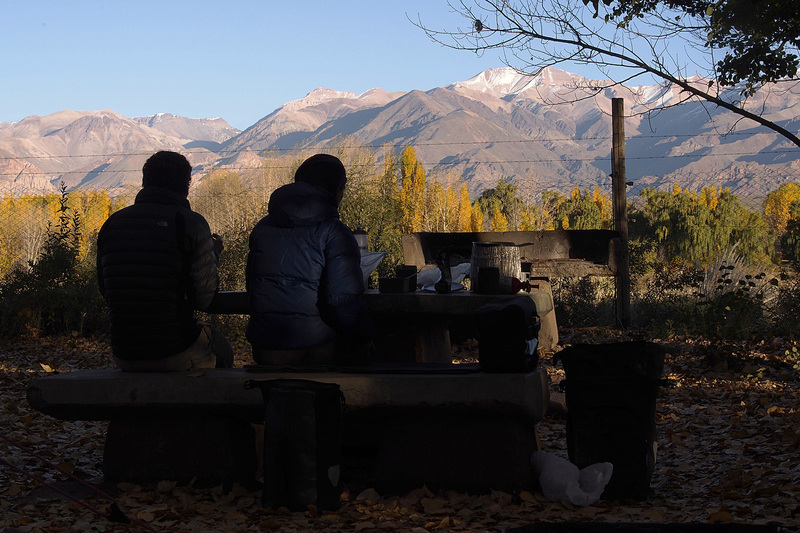 It was a feast and a great way to end what had been a spectacular day of riding into the Andes. Sunset over the Uspallata valley. Our third day out of Mendoza continued another 65 km to Los Penitentes ski resort at an altitude of 2,600 metres above sea level. Leaving the lush Uspallata valley the road again snaked alongside the Mendoza River through the reds and browns of the Andes Mountains with the peaks reaching higher and higher into the crisp blue sky. 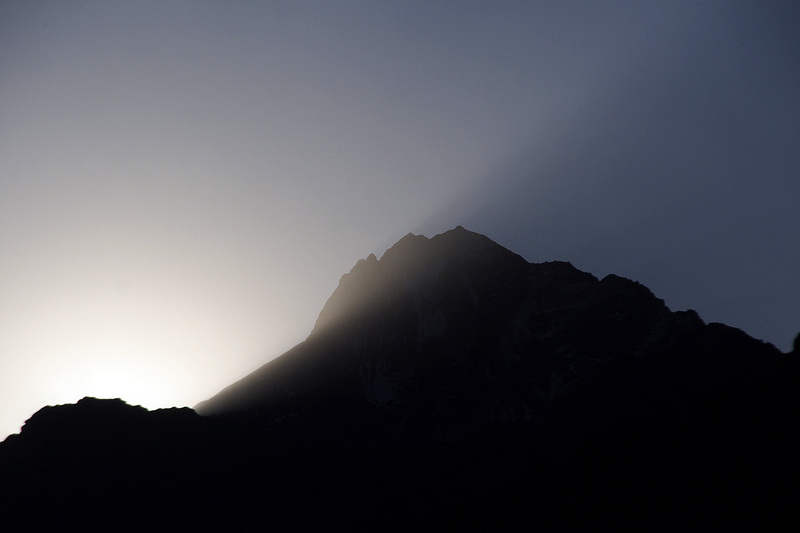 Sunrise over the mountains north of Uspallata. The road heading west from Uspallata further into Paso Cristo Redentor. 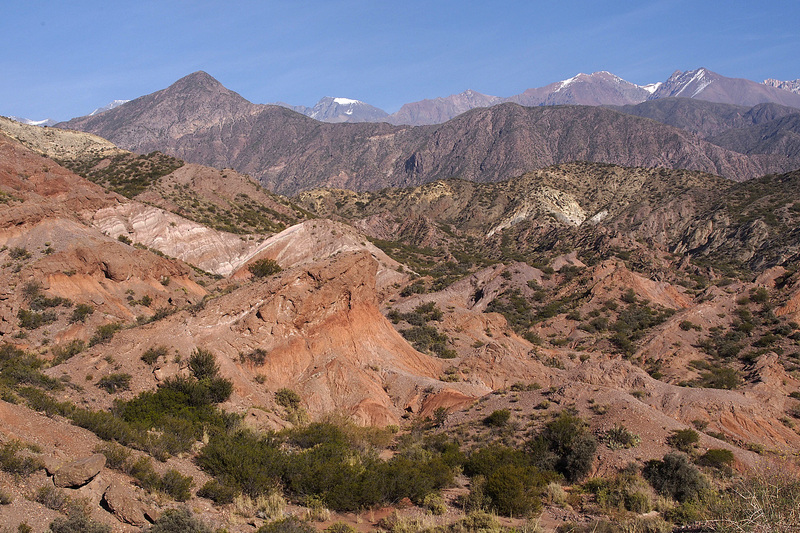 This mountain range contains the highest peak in the Americas: Cerro Aconcagua. 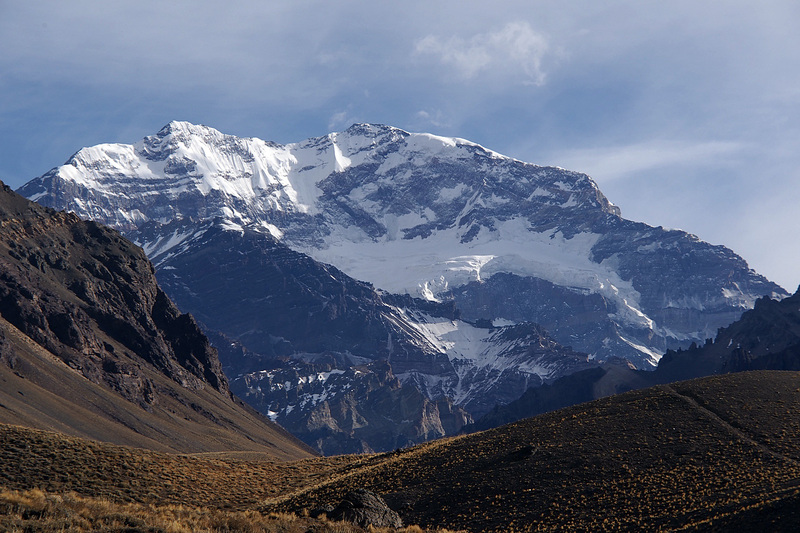 At 6,961 metres, it is the highest peak in both the western and southern hemispheres. It is second only to Mount Everest in terms of prominence, or the minimum height of climb to the summit on any route from a higher peak, or from sea level if there is no higher peak. Sorry for the mountaineering bafflegab, but this is quite the mountain. Rio Mendoza cuts a wide swath. 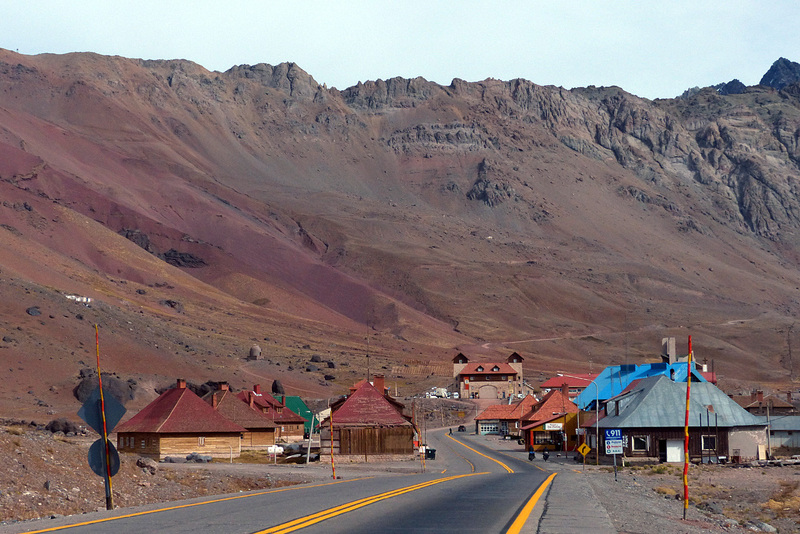 Unfortunately, because of the other high mountains around, Aconcagua is not visible until just past Los Penitentes through a valley running perpendicular from the highway a few kilometres before Cristo Redentor Pass. 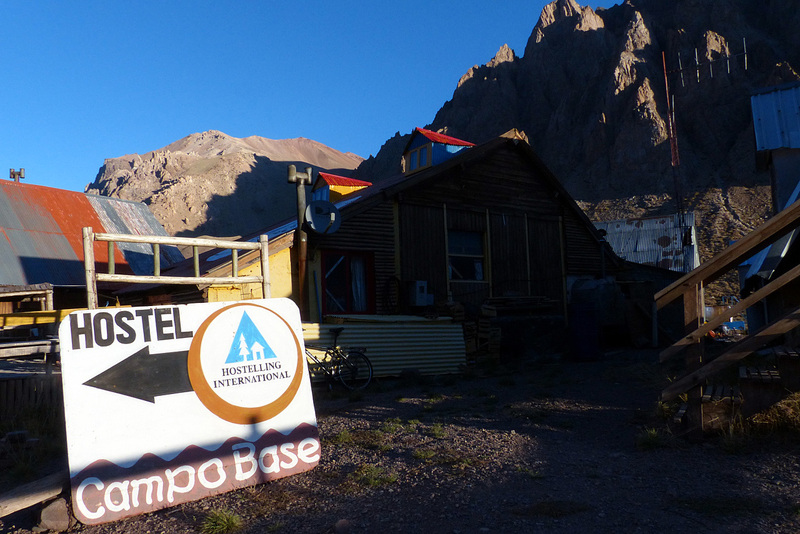 We stayed at a hostel in Los Penitentes as camping did not seem like the thing to do and we wanted an early-ish start in the morning to get over the pass and down the mountain on the Chilean side. We had the hostel all to ourselves. The final climb to Las Cuevas at 3,200 metres above sea level was only 20 km but seemed to take a long time. 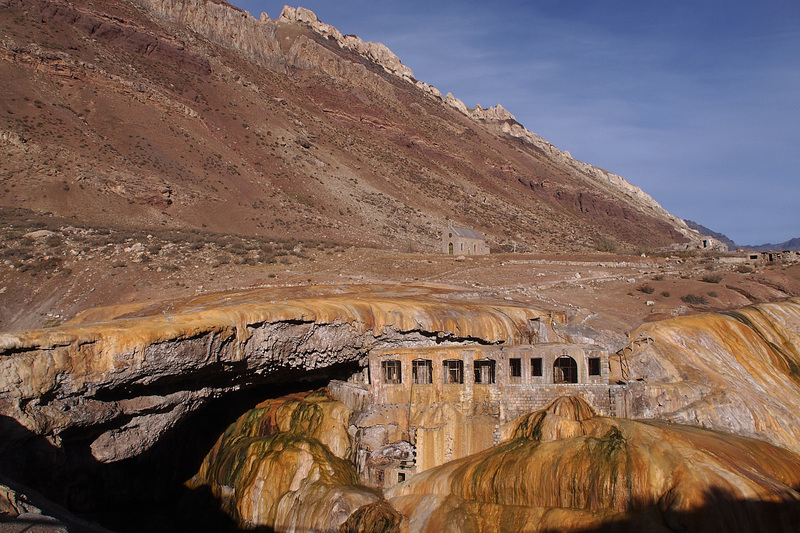 We did stop along the way at Puente del Inca and at the Aconcagua view point to take photographs. 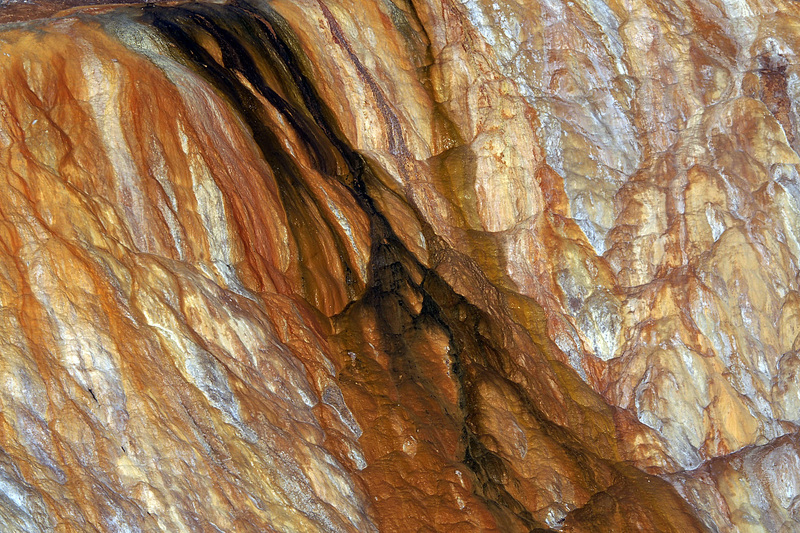 Puente del Inca mineral deposits. By noon we had arrived at Las Cuevas where we had lunch while debating whether to cycle the old road over the pass, which would mean climbing another 600 metres in elevation to 3,800 metres, over a 9-kilometre-long switchback gravel road. It was already afternoon and we decided to take the truck through the 3-kilometre-long tunnel instead. 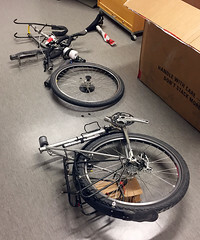 We were not allowed to cycle through the tunnel. 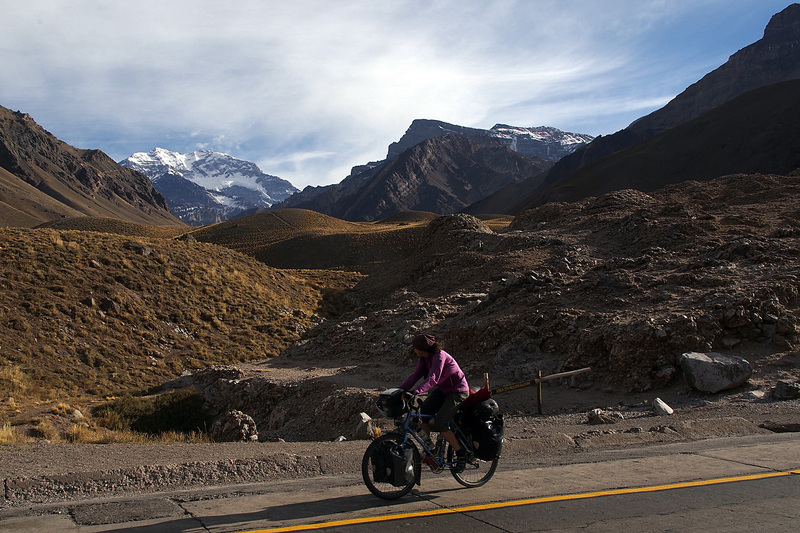 Jan riding past Aconcagua as we climb over 3,000 metres above sea level to the border with Chile. Cerro Aconcagua, the highest peak in the southern and western hemispheres. Approaching the pass at 3,200 metres above sea level. Las Cuevas and Cristo Redentor pass at 3,200 metres. Our shuttle through the Cristo Redentor tunnel. 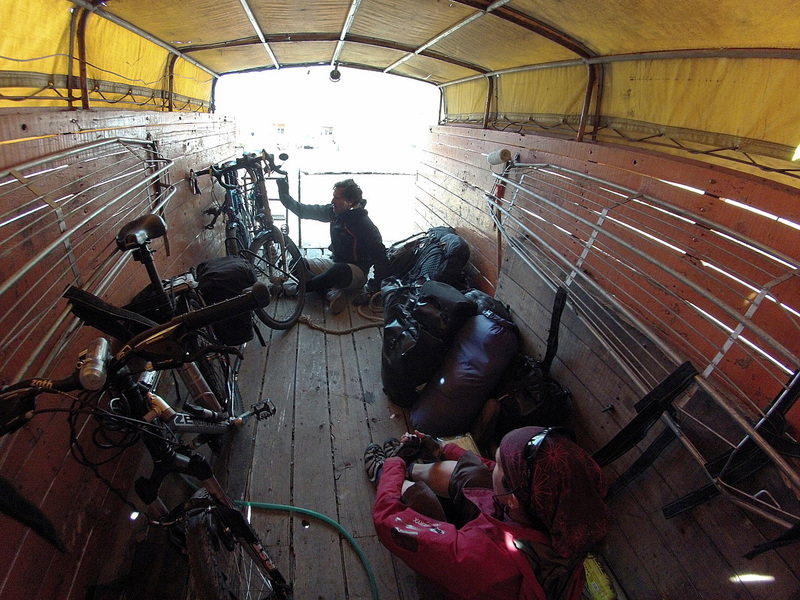 The bikes and gear and the three of us were loaded into the back of the truck and a few minutes later we emerged from the tunnel on the Chilean side of the mountain with a view of the backside of Aconcagua. Now the fun began as we descended what is known as the Caracoles – Snails, or Switchbacks, in English. Twenty-nine of them. Cycling on the old road past the snow sheds through which the new road runs. It was quite an impressive view looking down from the edge of one of the higher switchbacks to see them all stacked up down the steep mountainside with trucks and buses crawling up and down through the tight corners. This was one of those few times when we were able to travel faster than the trucks that had been steadily passing us by for the last three days as we climbed up from Mendoza. 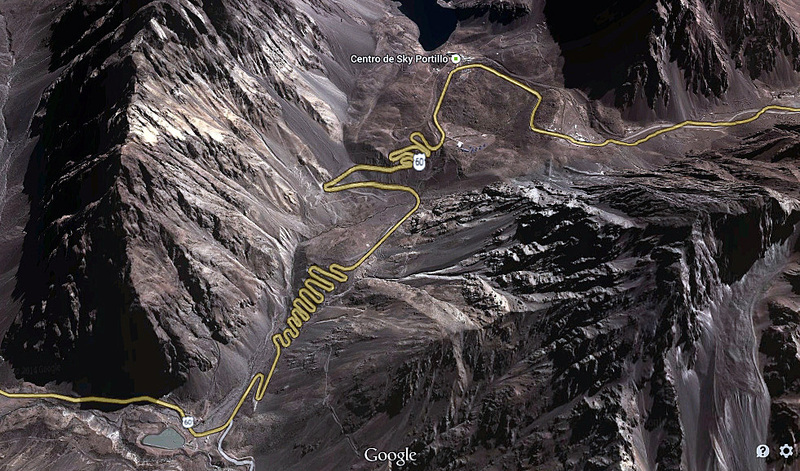 Aerial of the road through Cristo Redentor pass on the Chilean side. Jan starting the run down 29 switchbacks from the top of Cristo Redentor pass. The ride down was exhilarating and only somewhat subdued by the stiff westerly that blew at us, slowing us down a bit in places but also helping us as we did not need to squeeze the brakes continuously to keep our speed at a safe and manageable level. My fastest recorded speed on the GPS was 70 – way too fast. Most of the time we were rattling along at 35-50 km/hr. 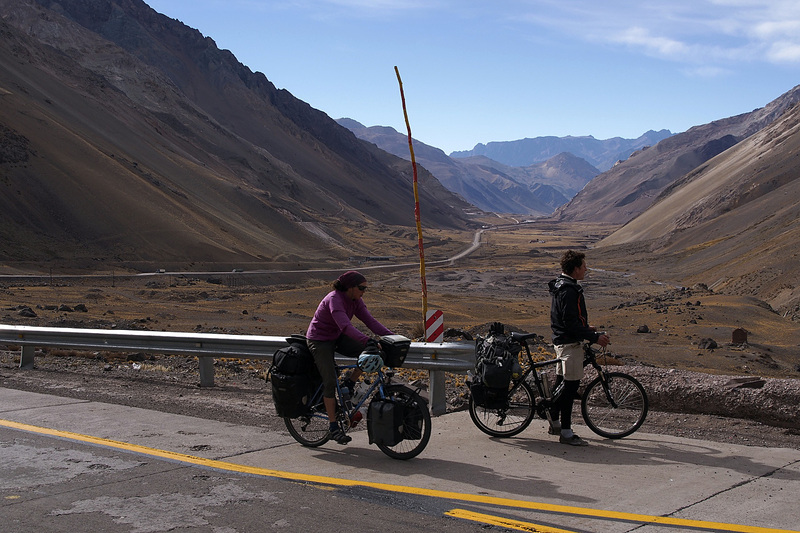 It had taken us 3 days to cycle and climb 182 km from Mendoza and it took a mere 5 hours to descend 90 km on the much steeper Chilean side of the Andes. Gravity is an amazing thing. We said farewell to Cyrille at Los Andes as we cycled a bit further west to the small town of Santa Maria where we were warmly welcomed by Warm Showers hosts Ed Flaherty and Jenn Hoover. 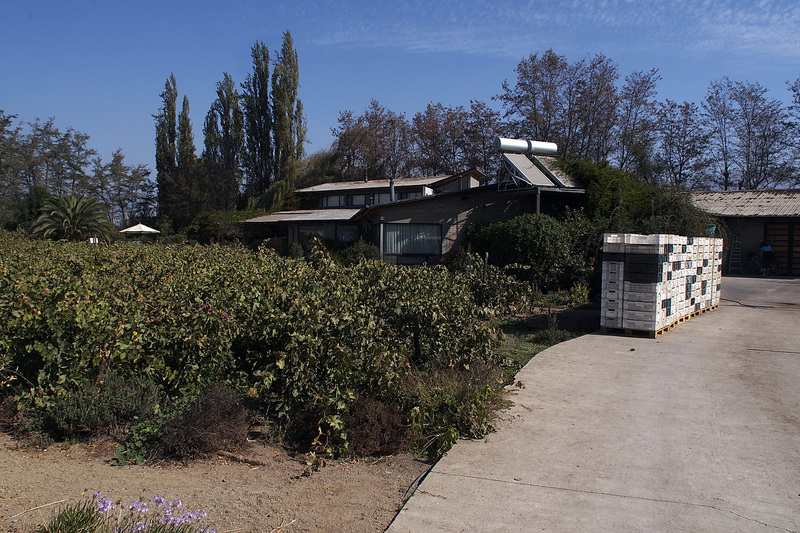 They are the proprietors of Flaherty Wines, one of the few boutique wineries in Chile. Flaherty Wines, the home of Ed and Jenn. 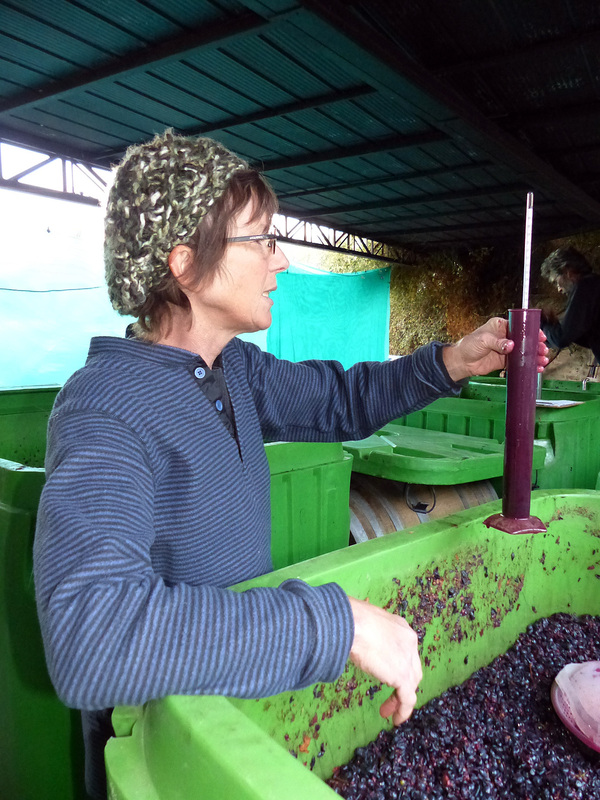 Originally from California, Ed and Jenn came to Chile in 1993 to work a harvest and never left. They have settled in the Santa Maria area with their young sons, Ben and Sean, and built Flaherty Wines over the last decade from a production of less than 100 cases in 2004 to about 1,000 cases in 2011. They generously shared their beautiful home with us for two nights and fed us great food paired with delicious wine. Thank you Ed and Jenn. It is the generosity of the people we meet along the way that make our journey so special. Glad you made it over the Andes safely and in good time. Looks like a beautiful ride! It was great meeting you both in Maipu. We have finally gotten around to posting our little bit on Maipu, you two take a great picture before breakfast! You can check it out on parrplanet.com if you are interested… your pictures are just gorgeous! Awesome, as always Mr. and Mrs. Switchback! We loved Uspallata and Aconcagua too! Kisses from Lima (tomorrow Bogota). 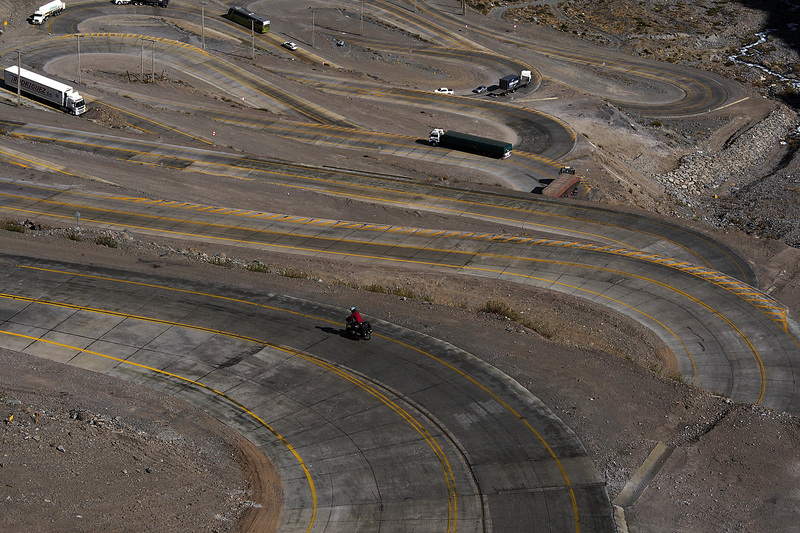 “Holy Cristo Redentor switchbacks Batman”… wow. Continued happy trails you 2 intrepid travelers!